Nice saw with impressive power from the 18V batteries. Good ergonomics and handling with the following exception: Narrow blade opening in the table and the ample blade guard makes it a bit difficult to get a good view of the blade and your cut line while cutting. I thought a saw with the blade on the left would minimize this problem, yet with some adjustment from my usual cutting position, it still works pretty good.... its just in those situations when you don't have the 'ideal' position to make your cut that you really notice it. Charger recharges drained batteries fairly quickly, and as a bonus... the 18V batteries also fit my Milwaukee reciprocating sawzall. 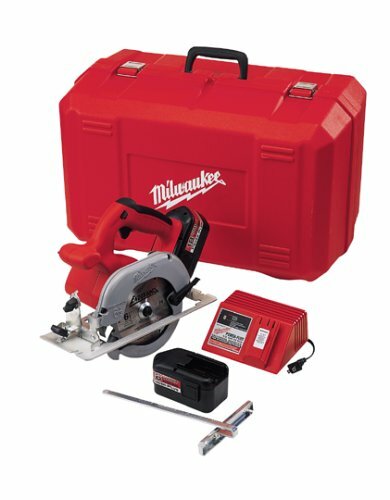 The Milwakee 18v circular saw is a great saw. The 18 volts gives it enough power to cut through even very hard woods, and by the time the battery gets low, the second battery is already charged and ready to go. I used this saw on a project with Mangeris wood, which is HARD. The saw had more than enough power to do the job without slowing or binding, and cuts were straight and true. The best part about this saw, though, was that it just feels right in your hand. Balance is critical in an 18volt tool, and the Milwakee is perfect. I spent all day with it and didn't get overtired. I've used other circular saws, both corded and cordless, but this is by far my favourite. 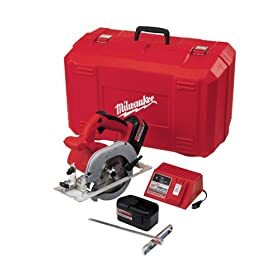 After checking and trying several options including 3& 4 piece "package Deals" I decided I did not need the other items and this was the best saw for my purpose, it was also made in the USA. I am pleased with my decision.